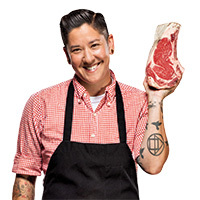 ➻ Born in Tokyo and educated at the French Culinary Institute of New York, Nakamura apprenticed upstate at Fleisher’s Meats before coming to Los Angeles. 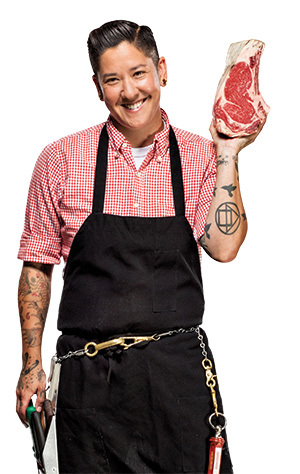 She and Amelia “Lindy” Posada opened their shop, Lindy & Grundy’s Meats, in the Fairfax District, in 2011. By using every part of the animal, they aimed to fill the void of sustainable butchers in the area. ➻ The most popular items Lindy & Grundy sells are ground beef, sausages, three-week dry-aged cowboy steaks, and fresh bone-in New York strip steaks. ➻ Butchers in ancient Egypt wore high heels to help them step over the gore. ➻ In 1769, an expedition led by Gaspar de Portolá and Father Junípero Serra brought a herd of longhorn cattle to San Diego. These later became California’s first economically viable trading product. ➻ There are close to 6,000 butchers in the Los Angeles area, according to the U.S. Bureau of Labor Statistics. Most of them work in grocery stores.